Okay. Let's just talk about it and get it over with. Since I was about 14 years old I've perpetually been on a diet. I've never been a skinny girl. I grew up being made fun of, yo-yo dieting and at the ripe age of 32 have decided that being on a diet and being required to work out is just who I am and that the older I get, the more I'm going to need to do it. Add in having a baby and you've got yourself a real disaster when you're me. Now... I have done well. I gained 40 pounds in my pregnancy. I'm pretty sure the majority of it was Jack, but otherwise it was all water in my feet. I lost 25 pounds very quickly, within just a couple weeks. The rest kind of melted away a bit at a time and I am PROUDLY at the weight I was when I got pregnant a bit over a year ago now. However... things are... different. While losing the weight somehow seems to be going a lot better this time around, I definitely need to get back to the gym to start toning things up. I miraculously talked my DH into letting me stay at my gym (which is a big ol' chain club here in the Twin Cities that pretty much took over all the other chains). I just can't let go of my classes!! Now... to find the time to actually get to them. I am hoping that my hub will get inspired to go and workout there as well once we get the membership stuff figured out. I think it will be a great place for our family once Jack gets a little older. As I write this I am thinking how many times over I will have to get the motivation back over the course of my life. I hate that I wasn't born with a great metabolism. I hate that I have to work so hard at this. I envy those that don't have to try or eat whatever and as much as they want. I do know that I have done it before and will do it again- let's just hope that I can get it to stick this time around and don't have to start over from scratch. We are starting to discuss TTC #2. Reason being that it took us 2 1/2 years to conceive Jack. We can either wait, have it take another 2 1/2 years and I'll be freakin' ancient by the time I conceive again, or we can just get started and take our chances. If it happens early, we'll have our hands full, but if it takes awhile, I won't be so old! Reason I bring up TTC and pregnancy is that I want terribly to be in good shape for my next pregnancy. I didn't necessarily struggle with Jack (I was sick for the most of the first half), but the pelvic pain would've been more manageable had I been in better shape. That said- I have much different intentions next time around! Check back in tonight as I tear apart tonight's American Idol hopefuls! Seriously. My house has been plagued by illness after illness after illness... will we ever get a break? I just got over my latest stomach virus. Yay. Fun. Now, both my baby and my husband are getting it. My co-worker had it. For the love of god- how do you stop this crazy thing from going around?? Jack turned 5 months old yesterday! I can hardly believe how fast he is growing up. 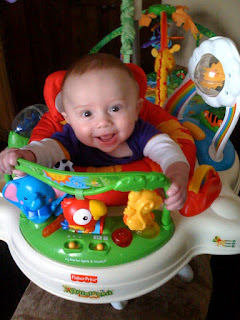 He is getting so big- we'll find out HOW big he's grown in the past 4 weeks at his ear checkup next week. Yup, his EAR checkup. My poor baby had a double ear infection about 3 weeks ago and had to be on antibiotics. AND it happened right before my DH had to be out of town in business for practically 2 weeks straight. He is still thriving though and is the happiest most content baby I've ever known in my life. He's my angel and I continue to adore and love him more with every day that goes by. I am glad that Joanna Pawhateverhernameis got booted- give the REAL amateurs a fighting chance! I don't know if I'll be able to tolerate watching Tatiana. Talk about people you just want to punch. I'm anxious to see the blind guy- but, is it just me or does he look down at his hands a lot when he is playing piano? How blind is he again? Just sayin. On another note- I am fighting the big fight with my IT department at work to allow me access into Social Networking sites. Apparently a solid business plan and free advertising isn't important to IT. WTF business is it of theirs anyway??? There it is. My mixed bag of rant for the day! Ha!